Removing red grease pencil marks can be a daunting task. Because the markings are grease-based, they may not respond to typical cleaning solutions. The red pigment in the pencil makes the job particularly difficult because it doesn't blend well into most surfaces. There are several tactics you can try to remove red grease pencil from different surfaces. 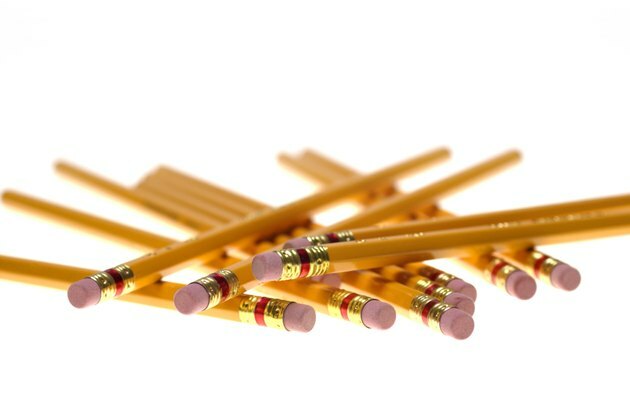 The pencil most likely will not come up off of many cloth items, but can be peeled away from furniture, floors and carpets in most instances. Wipe the red grease pencil marks lightly with a soft rag to remove any excess dirt or dust from the area. Do not press down hard enough to smear the grease pencil stain, as that will only make things worse. Place an ice pack on the grease pencil stain for five to 10 minutes. Lift up the ice pack, then attempt to scrape up the red grease pencil marks with a butter knife. This works best on solid surfaces, such as wood flooring, tile and furniture. Squirt 1 tsp. of mild dish soap into a bowl and fill the bowl the rest of the way with water. Dip a scratch-free scrubbing pad into the soapy solution and wipe the grease pencil stain until it fades. Rinse the area clean with warm water. This approach works well on any surface that can tolerate moisture, but should be avoided on carpeting. Layer several clean, dry rags over the grease pencil stain. Heat an iron to medium heat, then place the hot iron on top of the rags. Leave the iron there for several minutes, monitoring it the entire time. The heat should melt the grease pencil stains and the rags will soak up the marks. This works on all surfaces, but is most successful on carpeting and other cloth surfaces. Make sure to test the tactic on an out-of-the-way area if you aren't sure the surface is heatproof. Soak the tip of a cotton swab in nail polish remover and gently rub the stain with the swab until lifts the marks. This will best remove grease pencil from solid surfaces.